Nearly one year after his installation as university pastor, Rev. Drew Tucker has already made quite an impact. It was Oct. 18, 2017, that Tucker would begin his path to Columbus. He announced to his friends, family, and the church he was currently serving that he had taken the call from Capital. A short month after, on Nov. 27, Tucker started at the university. Prior to his arrival on campus, he had also worked with colleges in southwestern Virginia, serving Radford University as well as Virginia Tech. Working in the spheres of redevelopment and college religious life made Tucker a prime fit for his current position. In addition to his vocational resume, Tucker earned his undergraduate degree from Ashland University and attended seminary at Duke University’s Divinity School. Tucker speaks highly of his time at seminary, talking of great experiences and friendships he still has, not to mention an NCAA national championship win for Duke’s men’s basketball program. However, it was very clear that his experience will be put to good use throughout the regrowth of Capital’s relationship with Trinity Lutheran Seminary following the merge in January. Tucker said that he has already seen growth within the past year pertaining to the merger, and knows how to foster even more despite potential growing pains. Plans are clear from the seminary’s point of view. “As we’ve made progress … we apologize for things that have gone wrong, we highlight the things that being part of Capital lets us do … we are actually working on common events that will not just help seminary enrollment, but feature the work of our undergraduates as well,” Tucker said. Since the fall semester of 2015, Capital has been through three individuals in the position of university pastor. However, Tucker says that he “knew blessedly little” about this turnover prior to his arrival, and has let the fact that he is friends with people who have previously held his position help him remain unfazed and unpressured. If anything, it has empowered him. Whether dealing with the growing pains of the recent Trinity merger or trying to establish consistency in the office he holds, Tucker largely credits the growth of religious life on campus over his first year to the engagement of this year’s first-year class, the class of 2022. He speaks highly of the impact they have already had in his short time on campus, though he added that it is strange to think that many of them were just born around the time he graduated from high school. The past year has been quite a period of transition for the university, but also a hotbed of growth. 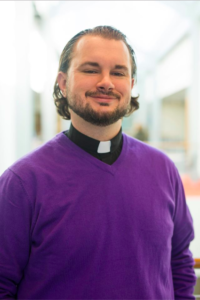 Due to Tucker’s work, a new beginning with Trinity Lutheran Seminary, and the apparent investment of students, religious life here can be expected to flourish within the coming years.